If you have a swimming pool and it is starting to age, not always are you needing to do a complete pool remodel. 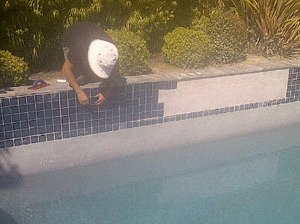 We have trained, professional technicians that are able to provide you with swimming pool restoration. This is when we will repair or replace sections of the swimming pool surfaces to make them look as good as possible. In turn you will spend less and still have a pool that is safe and functional while looking as good as it can for it’s age. Below we will discuss the various swimming pool restoration services and how we perform them. There are various types of pool surfaces installed in swimming pools today. And with our swimming pool restoration services, you don’t need to replace it if there are only small problems. If the pools surface is in good condition, our skilled technicians can make repairs to the surface making it look almost like it was never there. Unfortunately, the waters chemistry and age plays some role in making an exact match when it comes to doing this type of pool restoration. 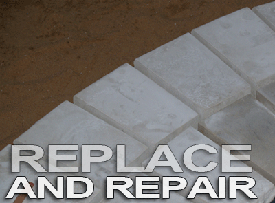 We offer pool plaster repair that can help resolve any pool rust repairs or any pool plaster cracks. When these issues arise, they need to be repaired by trained professionals. If not, you may have it happen again or it can become a bigger problem down the road. 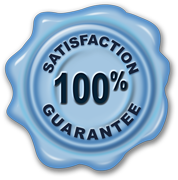 We always recommend using a licensed swimming pool contractor when having these services performed. We also perform pebble pool patches for pool rust spots and cracks in the surface. Our swimming pool restoration specialists have the knowledge necessary to do the repairs right the first time saving you from worrying about future damage. When it comes to this type of swimming pool restoration, we find that most often people can benefit from just performing the pool tile repair. It is only on occasion when we find that there are to many areas of pool tile failing. If and when that happens, it is most often better to remove all of the existing pool tile to help identify the problems. With a pool tile repair, we do the same thing. We will remove the affected pool tile so that we can find the reason for it failing and so that we can make all necessary repairs. This swimming pool restoration process is much more cost effective because normally there is only a small section failing. If you have the existing pool tile, we can use those pieces for the repair. If not, we will need to use something that matches as close as possible to the existing. With older pool tile, it is hard to find because it often becomes obsolete. If it is not available, there is always something close to what you have. If it is a mosaic pattern, then we need to get creative. Our swimming pool restoration specialists are always able to figure it out. 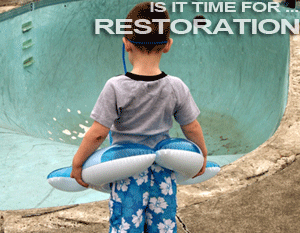 This swimming pool restoration service is one that can be a safety issue. Whenever there is a problem needing a pool coping repair, you want to have it done right away. If there is a broken, missing or loose piece of coping, it can cause someone to slip or fall. Pool coping comes in various forms. You have brick coping, cast or poured concrete along with natural stone pool coping. Which ever type of material you have, our trained swimming pool restoration specialists can help. If the pieces or pieces are broken, don’t worry. We are able to match these materials without the look being to far from the existing materials. Only when the pool coping is old or has been damaged from poor water chemistry is there a problem. We will remove the affected area to determine why the problem occurred. Once we fix the issue we will make all necessary repairs to ensure the work is done correctly the first time. 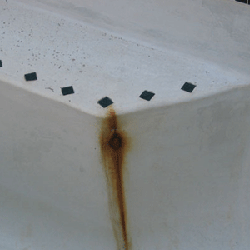 This swimming pool restoration service is one that needs to be treated with caution. A pool acid wash is used to remove slight or mild pool surface staining. When performing this type of service, you want to make sure the pool acid wash is not to aggressive. when you apply acid to the pools surface, it is removing the stains along with a small amount of the surface. That is why this swimming pool restoration service is only used for certain circumstances. When you have a pool that is in good condition and it only has some light staining, there is another method. We can perform a stain removal process on the pool surface that most of the time, will treat the problem. When the pool is older or has some damage to the surface, then doing a pool acid wash is not the worst thing. Again always be sure what you are doing it for and what results you are expecting. Not always will a pool acid wash even remove pool stains from the surface. Often the stains are to severe to make any improvements on the overall look of the pool. Our trained swimming pool restoration technicians are well trained at knowing what can be done to help. Pool expansion joint or Deck O Seal is the rubbery material that separates the pool deck from the pool coping. Without this, the swimming pool and deck would collide. If this happens, there is usually some damage that occurs. 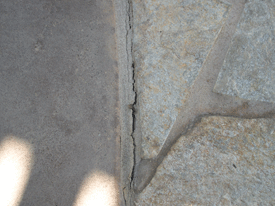 Either the deck will exhibit cracks or the pool surfaces, tile and coping can crack. By having this material in there, it gives some absorption when the pool expands and contracts during the seasonal temperature changes. This swimming pool restoration service is usual needed every 3-4 years depending on the swimming pool conditions. It can last longer and it may not last more than a year. Natural shifting and settling can cause the material to fail. Every case is different. This is a necessary product though and without it you may also encounter soil erosion. This can cause the pool deck to crack due to no compaction and it may also cause water to sit behind the pool causing other types of issues. Our swimming pool restoration technicians can come out and install a new expansion joint/Deck O Seal ensuring that your swimming pool is safe and looks good. You will know when it is time to replace when it starts to crack open or separates from the deck or coping. We offer all of these swimming pool restoration services to all of San Diego including Alpine, Bay Park, Bonsall, Bonita, Cardiff By The Sea, Carmel Valley, Carlsbad, Chula Vista, Clairemont, Coronado, Del Cerro, Del Mar, El Cajon, Elfin Forest, Encinitas, Escondidio, Fallbrook, Fairbanks Ranch, Kensington, La Costa, La Jolla, Lakeside, La Mesa, Linda Vista, Mira Mesa, Mission Hills, Mission Village, North Park, Oceanside, Ocean Beach, Pacific Beach, Pauma Valley, Point Loma, Poway, Rancho Bernardo, Rancho Penasquitos, Rancho San diego, Rancho Santa Fe, San Diego, San Marcos, Santaluz, Santee, San Carlos, Scripps Ranch, Sorrento Valley, Solana Beach, Spring Valley, Tierrasanta, University City, Valley Center, Vista, 4S Ranch. If you have any questions about any services or want to schedule a estimate, we can help. Give us a call today at (868) 693-3307 or fill out our contact form. We are happy to help you with any pool restoration services.